Denver may be known, in part, for its "Old West" roots, but the Colorado city is all about new tech, according to a recently published study. The personal finance research firm ValuePenguin ranked Denver as the fourth best city for tech careers. ValuePenguin study author Douglas Burger compiled 19 data points from five reputable sources -- including the U.S. Census Bureau, the U.S. Patent and Trademark Office and the National Science Board -- in order to formulate its results. You can view the full study here. Some of the statistics under consideration: everything from computer science graduate programs and tech companies' payrolls to cell phone speed and patents awarded. Colorado's capital city ranked behind Boston, San Jose (the heart of the Silicon Valley) and San Francisco and ahead of fifth-ranked Baltimore to round out the top five. Denver's data represented that of its metropolitan statistical area, which also comprised the nearby cities of Aurora and Lakewood. The study dropped 19 data points into four buckets, which focused on education, employers, livability and ideal work environments. Denver ranked fourth in the "Who's Hiring" category, which included data points like the number and payroll of tech companies within the area. 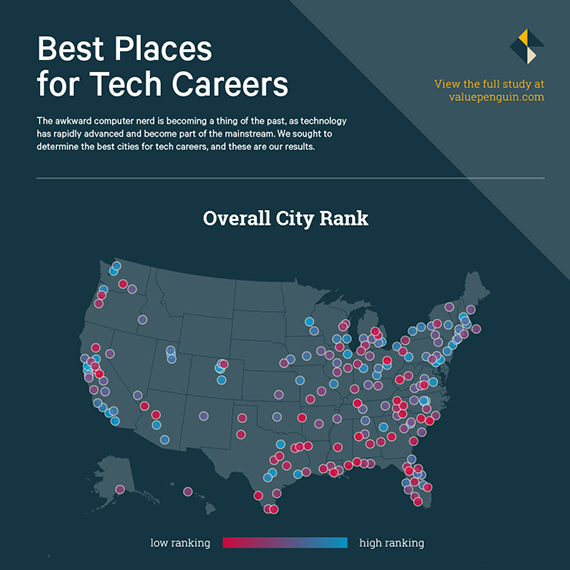 Denver also ranked seventh in the "Where to Work" category, which highlighted data points like the median annual wage of tech professionals and the count of utility patent grants for each of the 190 cities analyzed in the study. Denver, of course, is home to some technology giants' offices, a group that features IBM and Oracle. All told, the Colorado metropolis is a great place for emerging technology professionals to begin or continue their careers. The Mile-High city breaks away from the crowd. Most of the cities that finished near the top of the list were coastal. The only other Colorado cities to break into the top 25 were Boulder and Colorado Springs -- finishing 18th and 20th respectively.